As Hurricane Florence approaches the Carolina coast, The Weather Channel has provided a mind-blowing, and frankly horrifying visualization of just how bad things could get in the path of the storm. In the clip below, Weather Channel meteorologist Erika L. Navarro explains what happens during a storm surge — a coastal flood of rising water associated with hurricanes that has tsunami-like effects — and how dangerous one can be. 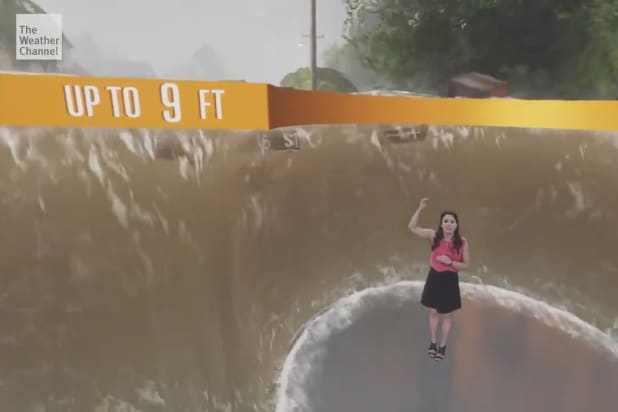 As you can see, thanks to some extremely clever use of green screen, Navarro appears to be transported from the newsroom to a city street, where incoming flood waters rise first three feet, then six feet, and finally to a biblical-looking nine feet high. But this isn’t just a cool-looking video. Storm surge is a very real danger for several coastal communities already affected by Florence, with surges of up to six feet reported in one location, according to North Carolina NBC affiliate WAVY. Ahead of Hurricane Florence making landfall, North Carolina, South Carolina, and Virginia have issued mandatory evacuations for several coastal communities. Currently a category one storm, Florence has winds of up to 90 mph, and as of 11 p.m. ET was centered 60 miles east-southeast of Wilmington, North Carolina, according to the National Hurricane Center.